Yes my fellow countrymen and women of the Philippine tokusatsu community, it's time to rejoice after years of waiting for another Ultraman movie to premiere in our local cinemas, SM Cinema has announced that they will have a screening of the Ultraman Ginga movie! According to the image above, the Ultraman Ginga movie (no word yet if it's the first movie or the 10 Ultra Brothers Showdown) will premiere next month, September 10-11 via an SM cinema family promo. Rest assured that team JEFusion will be there to cover the moment. Let's all hope that this will be the return of the tokusatsu genre in the Philippines whether it's on local TV or local cinemas! Source: Manila Bulletin and and one of my long time close friend, Sharo Tadeza for the heads-up! 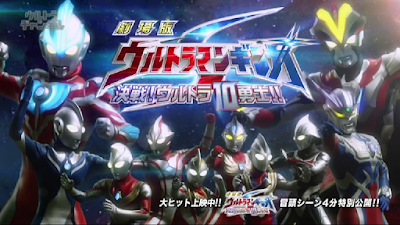 And insteas of "My body is ready," I'll instead say Ultraman's grunt: "SHAAAA!!!" I sure hope it's the 10 Ultra Brothers showdown cuz I need to see Arisa-chan.....!